DIE Jovis, videlicet, 26 die Maii. Earl of Peterborough ordered by the King to attend Him at York. Sir Thomas Littleton's Waggon stayed, with Ordnance, &c.
E. of Sussex's Order about his Fishery. Serjeant Glanvile Leave to be absent. King's Letter to the Earl of Peterborough. 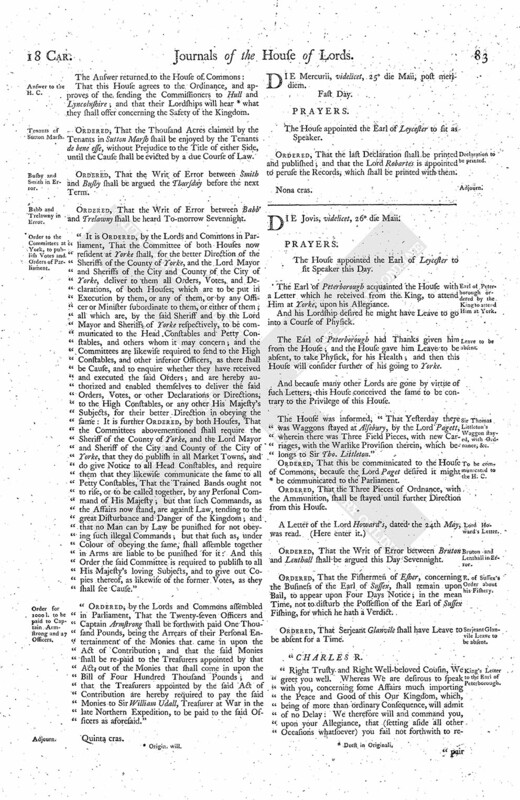 Bill for a Synod to settle the Doctrine of the Church. Scots Commissioners desire their Paper may be considered. Conference to be had about it. Lords that are gone to York without Leave. Lords who have received Letters to go to York, to acquaint the House with them. Message to the H C. for a Conference about Lord Paget's Letter; with the Addition to the Bill for the Synod; and to acquaint them with the Scots Commissioners Paper, for perfecting the Treaty. Hawes's Petition. Brag and Rosewell in Error. Message from the H. C. that some Records quoted in the Votes about the King may be printed with them. To expedite the Declaration in Answer to the King's about Hull. With Names of Deputy Lieutenants. And for the Lords to sit a while. Messenger that was detained at York examined. And with an Order for restoring Arms at Harwich to Essex. Deputy Lieutenants of Essex and Norfolk to fill up the Commissions for Colonels and Captains. and for Sir Richard Samuel to be a Deputy Lieutenant of Northampton. Arms at Harwich to be restored to the County. The House appointed the Earl of Leycester to sit Speaker this Day. The Earl of Peterborough acquainted the House with a Letter which he received from the King, to attend Him at Yorke, upon his Allegiance. And his Lordship desired he might have Leave to go into a Course of Physick. The Earl of Peterborough had Thanks given him from the House; and the House gave him Leave to be absent, to take Physick, for his Health; and then this House will consider further of his going to Yorke. And because many other Lords are gone by virtue of such Letters, this House conceived the same to be contrary to the Privilege of this House. The House was informed, "That Yesterday there was Waggons stayed at Alsebury, by the Lord Pagett, wherein there was Three Field Pieces, with new Carriages, with the Warlike Provision therein, which belongs to Sir Tho. Littleton. Ordered, That this be communicated to the House of Commons, because the Lord Paget desired it might (fn. 1) be communicated to the Parliament. Ordered, That the Three Pieces of Ordnance, with the Ammunition, shall be stayed until further Direction from this House. Ordered, That the Writ of Error between Bruton and Lenthall shall be argued this Day Sevennight. Ordered, That the Fishermen of Esher, concerning the Business of the Earl of Sussex, shall remain upon Bail, to appear upon Four Days Notice; in the mean Time, not to disturb the Possession of the Earl of Sussex Fishing, for which he hath a Verdict. Ordered, That Serjeant Glanvile shall have Leave to be absent for a Time. Right Trusty and Right Well-beloved Cousin, We greet you well. Whereas We are desirous to speak with you, concerning some Affairs much importing the Peace and Good of this Our Kingdom, which, being of more than ordinary Consequence, will admit of no Delay: We therefore will and command you, upon your Allegiance, that (setting aside all other Occasions whatsoever) you fail not forthwith to re pair hither to Us, when We shall acquaint you with the particular Cause of Our sending for you, which is of that Importance as is neither fit to be imparted to you by Letter, nor will bear any Delay or Excuse; and for your ready Observance of this Our Command, these Our Letters shall be your sufficient Warrant. Given at Our Court at Yorke, the 20th of May, 1642. To Our Right Trusty and Right Well-beloved Cousin, John Earl of Peterborough. Doctor Westfeild, of Great St. Bartholmewes, in London; Doctor Somes, of Staynes, in the County of Midd; Mr. Lyford, Vicar of Sherborne, in Com. Dorsett; Doctor Ouldsworth, of St. Peters the Poor in London and Master of Emanuell College, in Cambridge; Mr. Carter, of Dinton, in Bukinghamshire; Mr. William Lance, of St. Michaell the Querne, in London; Mr. Hodges, of Kensington, in the County of Midd; Mr. Piern, of Wilby, in the County of North'ton; Mr. Prophett, of Marleborough, in the County of Wilts; Doctor Hamon, of Penshurst, in the County of Kent; Dr. Marsh, of St. Dunstans the West, in London; Mr. Peter Stirry; Mr. Earles, of Wilts; Mr. Gibbins, of Waltham, in Essex. The Time of Meeting to be 1 July next. 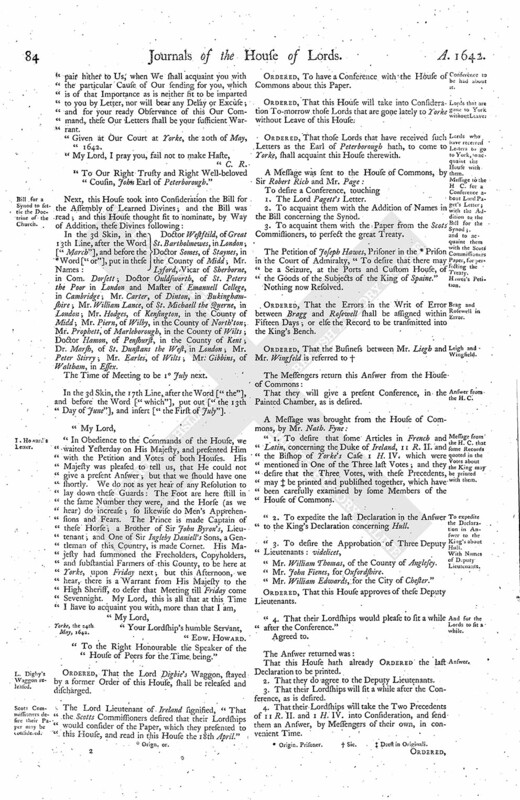 In the 3d Skin, the 17th Line, after the Word ["the"], and before the Word ["which"], put out ["the 13th Day of June"], and insert ["the First of July"]. Yorke, the 24th May, 1642. To the Right Honourable the Speaker of the House of Peers for the Time being. Ordered, That the Lord Digbie's Waggon, stayed by a former Order of this House, shall be released and discharged. The Lord Lieutenant of Ireland signified, "That the Scotts Commissioners desired that their Lordships would consider of the Paper, which they presented to this House, and read in this House the 18th April." Ordered, To have a Conference with the House of Commons about this Paper. Ordered, That this House will take into Consideration To-morrow those Lords that are gone lately to Yorke without Leave of this House. Ordered, That those Lords that have received such Letters as the Earl of Peterborough hath, to come to Yorke, shall acquaint this House therewith. 1. The Lord Pagett's Letter. 2. To acquaint them with the Addition of Names in the Bill concerning the Synod. 3. To acquaint them with the Paper from the Scots Commissioners, to perfect the great Treaty. The Petition of Joseph Hawes, Prisoner in the (fn. 3) Prison in the Court of Admiralty, "To desire that there may be a Seizure, at the Ports and Custom House, of the Goods of the Subjects of the King of Spaine. Nothing now Resolved. Ordered, That the Errors in the Writ of Error between Bragg and Rosewell shall be assigned within Fifteen Days; or else the Record to be transmitted into the King's Bench. That they will give a present Conference, in the Painted Chamber, as is desired. 1. To desire that some Articles in French and Latin, concerning the Duke of Ireland, 11 R. II. and the Bishop of Yorke's Case 1 H. IV. which were mentioned in One of the Three last Votes; and they desire that the Three Votes, with these Precedents, may (fn. 5) be printed and published together, which have been carefully examined by some Members of the House of Commons. 2. To expedite the last Declaration in the Answer to the King's Declaration concerning Hull. "Mr. William Thomas, of the County of Anglesey. "Mr. John Fienes, for Oxfordshire. "Mr. William Edwards, for the City of Chester. Ordered, That this House approves of these Deputy Lieutenants. 4. That their Lordships would please to sit a while after the Conference. That this House hath already Ordered the last Declaration to be printed. 2. That they do agree to the Deputy Lieutenants. 3. That their Lordships will sit a while after the Conference, as is desired. 4. That their Lordships will take the Two Precedents of 11 R. II. and 1 H. IV. into Consideration, and send them an Answer, by Messengers of their own, in convenient Time. Ordered, That these Precedents are to be read Tomorrow. House was adjourned during Pleasure, and the Lords went to the Conference; which being ended, the House was resumed. "To let their (fn. 6) Lordships know, that the Earl of Warwicke, going to Sea in Haste, left divers Commissions for Colonels and Captains, but no Order to whom they should be directed; therefore they desire that this House would direct some Course how those Commissions may be directed. 2. To join in an Order with the House of Commons, concerning Arms to be restored to Essex, which are now at Harwich. Ordered, That this House is of Opinion, and thinks it fit, that the Deputy Lieutenants of the County of Essex and Norfolke make the Directions of the Commissions to Colonels and Captains as they shall think fit, until the Earl of Warwicke returns, or he gives further Order herein. That this House agrees with the House of Commons in this Order; and that the Lords are of Opinion, That the Deputy Lieutenants do direct the Commissions to such Persons as they think fit, until the Earl of Warwicke returns and gives further Order herein. That the House of Commons have received Information from the Committee (fn. 8) for the Sea Adventurers for Ireland, that the Ships that (fn. 6) are to go for that Service are in the Thames, (fn. 9) where they lie at a great Charge, for Want of Land-men; therefore the House of Commons desires that their Lordships would expedite the Ordinance lately brought up for the raising of Land Soldiers. 2. The House of Commons desired, That Sir Ric. Samuell may be recommended to the Lieutenant (fn. 10) of North'ton, to be a Deputy Lieutenant of that County. That their Lordships do agree that Sir Ric. Samuell be recommended to the Lord Lieutenant of North'tonshire; and for the Ordinance for raising of Land Soldiers to go in the Ships, the Lord that hath the Paper is not now present, being sick; but the Lords will send for the Papers, and send them an Answer, by Messengers of their own, in convenient Time. Ordered, That Cras and Ebron, &c. Lyncolnshiremen, shall be released, paying their Fees. 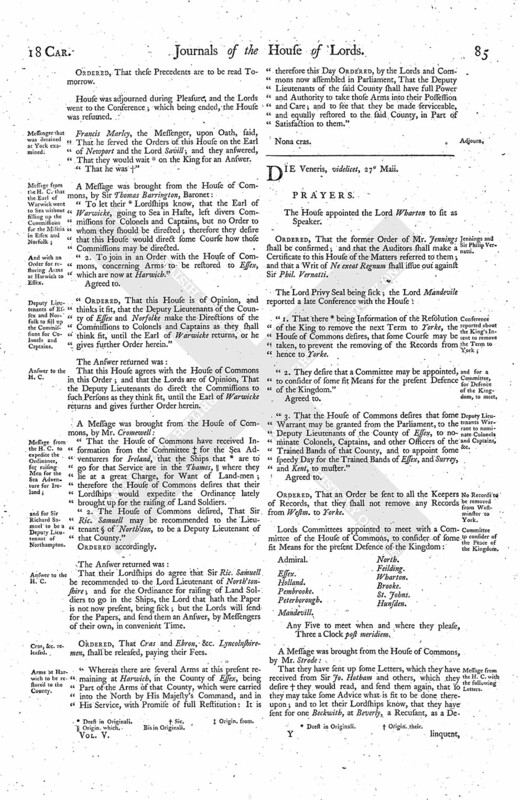 Whereas there are several Arms at this present remaining at Harwich, in the County of Essex, being Part of the Arms of that County, which were carried into the North by His Majesty's Command, and in His Service, with Promise of full Restitution: It is therefore this Day Ordered, by the Lords and Commons now assembled in Parliament, That the Deputy Lieutenants of the said County shall have full Power and Authority to take those Arms into their Possession and Care; and to see that they be made serviceable, and equally restored to the said County, in Part of Satisfaction to them.